There are a lot of reasons to straighten your teeth, and there are a lot of ways to do it. But you may not know that there are many unique times in your life when it might be best to straighten your teeth. In general, dentists begin considering the potential need to straighten a patient’s teeth around 8-10 years of age. 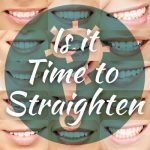 People of any age can have their teeth straightened – there is never a bad time – but there are certain times when it makes more sense. Dr. Joe Lee is a local provider of professional orthodontics and teeth straightening treatments. Read below to learn tips for deciding if it’s time to straighten your teeth. If you’re self-conscious about your smile at all, it’s time. If you cover your mouth when you laugh, or if you avoid social situations because you’re not confident, correcting your smile is a worthwhile investment. Your smile is your own personal accessory and it’s the first thing people notice. You deserve to feel proud of it. Is a big life event coming up where lots of pictures will be taken? If so, you will want to feel naturally confident in your smile. Consider straightening your teeth with enough time to enjoy the results during an important time of life, whether that’s a wedding, graduation, or starting a new career. Before cosmetic dentistry: straightening your teeth is often the first step to any major cosmetic work. This is to make sure that your final results will be aligned properly. Mysterious headaches could be caused by an unhealthy bite or teeth alignment. Straightening your teeth can relieve the pressure that causes pain in your mouth, face, head, and neck. Prevent decay: correcting your smile is an excellent way to prevent further damage if you experience the troubling buildup of plaque and decay on certain crooked teeth. This can also prevent chronic bad breath or dangerous gum disease. Of course, in real life, function and aesthetics are often connected. The adjustment period to starting orthodontic treatment is very short (perhaps 24 hours) and shouldn’t get in the way of anything you want to do. As Benjamin Franklin said, “Don’t put off until tomorrow what you can do today.” Dr. Joe Dentistry in Torrance is the right place to begin your journey toward straighter teeth. Contact us today to make an appointment to learn more and receive a professional consultation.